When the Lanpher Memorial Library celebrated our 100th Anniversary in 2016, we started two awards to be given annually. Both awards recognize people who have had an impact on the Library, our Community and the services we provide. The Marrion Hood Lanpher Memorial Library Legacy Award is given in memory of someone. The Spirit of Community Award is given in honor. Please read more about the awards, and the recipients. Marrion Hood was a long-time Librarian at the Lanpher Memorial Library. Over the years, Mrs. Hood was a volunteer, served as a Trustee, and worked as Librarian. She is credited with bringing the day-to-day operations and services of the Lanpher Memorial Library into the hearts and minds of the Hyde Park community. Her philosophy of service was to make sure the Library was attentive to the needs of the community, a tradition we continue to this day. Marrion Hood, Librarian, sits on the steps of the Lanpher Memorial Library, surrounded by children. Fostering community spirit is so important to us, that it is part of our mission statement. The Spirit of Community Award honors people who have helped us promote this part of our mission and have made an impact on the Library and our services. 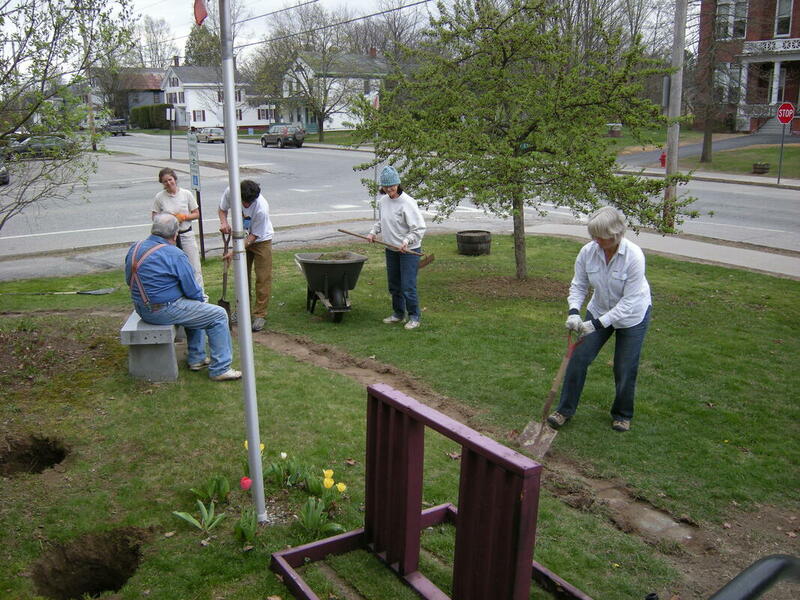 Community members come together to work on the Library lawn in the Spring. Gordie was a gentle man. He had a heart of gold. From the stories that he told. Such a clever way with rhyme. And nail it every time. He could oft stir up a tear. As his poems made them glow. You knew he cared about them. It always came out in the end. Gordie was a special man. Julie Rohleder served on the Lanpher Memorial Library Board of Trustees for 10 years, all ten as the Secretary. Julie was a valuable person to have on the Board because of her commitment to fiscal responsibility and organization skills. Her expertise is vast and varied. As an Engineer, her problem solving skills and building knowledge helped the Board make great decisions about how to move forward and her practical insights informed new policies and initiatives. Another good quality about Julie is, that for better or worse, we also got John! John started out visiting the library with his wisecracking observational commentary, but John doesn't just talk the talk. Over the years he has done countless "little" things around the Library...like refinishing chairs and tables, planing down shelves to fit book cases, creating a mold and making plaster castings to replace the missing spots of decorative trim on the 1916 part of the building.....just to name a few. To John, a simple trip to the Library and end up with the tool box in hand, tightening a door handle. Their Bed & Breakfast, The Fitch Hill Inn, is on the market, and eventually the Rohleders will move away from Hyde Park, but we are grateful to them for their involvement in the Library and the Hyde Park Community and proud that their names will always be on the plaque in the Lanpher Memorial Library. There is a cabinet at the Lanpher Memorial Library. The contents are monitored and used regularly. H.M. McFarland had the cabinet custom built to hold his bound copies of the News & Citizen. He also indexed by hand the papers with everything pertaining to Hyde Park and more. Henry Moses McFarland was born in 1852 and came to Hyde Park in 1878. Little did he know when he indexed his collections of the News & Citizen that one day there would exist a way to digitally get all the papers online for all to see. We wonder if he realized how valuable these index cards and newspapers would be to future Lanpher Library historical research? The Legacy of H.M. McFarland was dedicated with this Award during a "Stories of Yesteryear" program at the Library. His great-great-grandson, Calvin Pease was there to share a few words with us. The program was filmed by GMATV and a link can be found below. According to the book "Successful Vermonters", Henry Moses McFarland came to Hyde Park in 1878, fresh out of the University of Vermont, where he was Valedictorian of his class. He was principal of Lamoille Central Academy, became a lawyer and was eventually States Attorney,. He served on the Board of Trustees of the Village of Hyde Park, was a member of the Second Congregational Church, took a Knight Templar Degree as part of the Masonic Fraternity, was an Odd Fellow, belonged to the Vermont Society for the Sons of the American Revolution, Director of the Lamoille National Bank, Secretary of Civil Military Affairs under Gov. Carroll Page; he was Director of Union Mutual Fire Insurance Company, Incorporator of Lamoille Co. Savings Bank and Trust; Director of Hyde Park Lumber Company, and served as delegate from VT to the National Republican Anti-Saloon Convention in Chicago in 1886. Francis Favreau grew up in Hyde Park, first on the family farm and then in the Village. He remembers running the miles home from Johnson and coming up into the Village of Hyde Park, feeling the happy sensation of being HOME. He graduated from Lamoille Central Academy in 1952, then joined the Navy and studied Medical Technology in Minneapolis Minnesota. Francis married his wife Agnes in 1959 and they raised their family in Morrisville, VT.
Francis is a local historian who believes in sharing that history. He has made sure that the Lanpher Memorial Library has copies of everything Hyde Park. Francis also took on the project of transcribing Aunt Libby's Moonlight Rambles, articles from the 1918 News & Citizen describing Hyde Park neighborhoods. He collected them all into one volume and donated them to the Lanpher Library. While Francis has moved to Middlebury, we still rely on him when we get stuck with local history research. Much of the historical information we have at the Lanpher Library, and ease at sharing it with local history researchers, is due to the work, collecting, collating and mentoring of Francis Favreau. We are grateful to him and salute him with the Spirit of Community Award.